Hardcover with jacket, 544 pages, 13.5 x 21.5 cm, 5.3 x 8.5 in. Jan Kraus works as a geriatric nurse in Berlin. He was born in Vimperk, which used to be called Winterberg, in the Bohemian Forest, and has been living in Germany since 1986. The circumstances of his leaving the Czech Republic remain his secret. And his trauma. One of his patients is Wenzel Winterberg who was born in Liberec, Reichenberg. As a Sudeten-German he was expelled from Czechoslovakia after the war. When Kraus first meets him, he is lying in bed, paralysed and absent. It is the stories that Kraus tells about his home town of Vimperk that wake Winterberg up and bring him back to life. 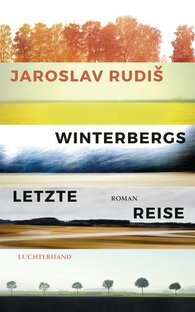 Yet Winterberg wants more from Kraus; he wants to go on one last journey with him, on the search for his lost love – a journey that takes them both through the history of central Europe: From Berlin to Sarajevo, through Reichenberg, Prague, Vienna and Budapest. For not only Kraus is hiding a secret – Winterberg is, too. "Winterberg’s Last Journey is a great European novel."